Measures: L36 X W28 X H9cm. Boxes come flat, easy to assemble. This 12 cupcake box is fantastic for presenting your beautiful cupcake creations. It has a clear window on the lid so you can see your yummy cupcakes. Base diameter: 60mm for the cupcake holes. These boxes are sold in 25 packs and include separate inserts for your cupcakes. 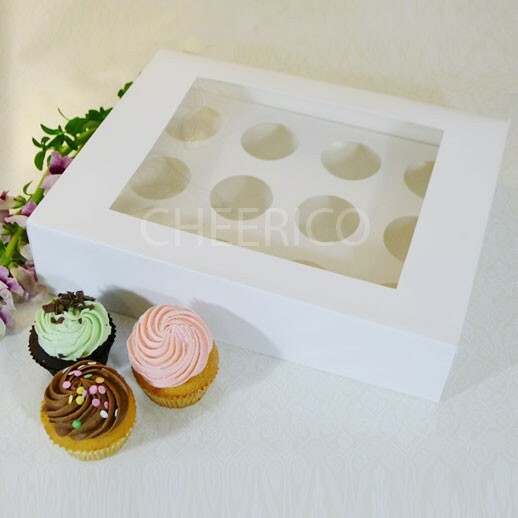 This cupcake box is made out of a high quality paperboard with a gloss finish. The perfect touch to presenting your mouth watering cupcakes. The separate cupcake insert holes measure at 6cm in diameter and once placed in the cupcake box, the distance between the insert and lid when closed is 7.5cm.